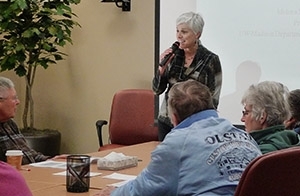 Melissa Stiles, MD, speaks to seniors at the Belleville Clinic as part of a group visit on falls prevention. The Department of Family Medicine’s (DFM) Melissa Stiles, MD, is leading innovative falls prevention group visits for seniors at UW Health Belleville Family Medicine. The visits are geared toward patients aged 65 and over who have been identified as high risk for falls according to UW Health clinical screening guidelines. Each visit begins with a group discussion on the importance of falls prevention. According to Dr. Stiles, one-third of people over age 65 who live at home have fallen in the past year; of those, 1.6 million visit the emergency room with a falls-related injury. Falls can directly result in disability and are the sixth-leading cause of death for seniors. Dr. Stiles then educates participants on the risk factors for falls and shows them effective strategies for preventing them. Exercises and yoga techniques to improve lower-extremity balance and strength are an integral part of those strategies. During the visit, Dr. Stiles also meets individually with every participant to create a plan tailored to their specific risks. That plan may include physical therapy, a community-based falls prevention program, or referral to the UW Health Faint and Fall Clinic. Dr. Stiles adapted the falls prevention visits from her Wellness in Seniors Empowerment Program, a 10-part program that addresses a variety of aging-related issues in a group-visit setting. Belleville is the first UW Health primary care clinic to offer falls prevention group visits. Contact Dr. Stiles if you are interested in referring patients or establishing a falls prevention group visit at your clinic.